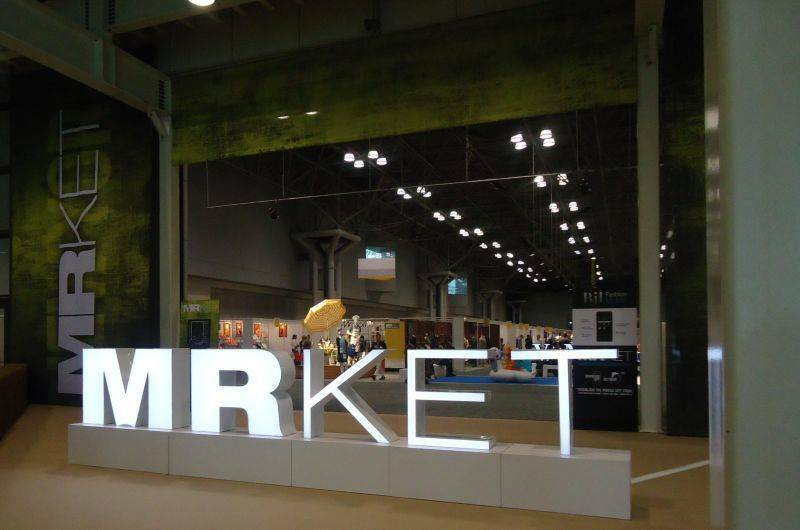 MRKET New York, the most important trade show for the menswear industry on the East Coast, just wrapped up at the Jacob Javits Center on July 24, where it started on July 22. The show presented the most interesting developments in what is trending in today’s menswear, characterized by classic and sartorial dressing, which are very much in line with the fashion offer the Italian brands brought to the fair. With 36 exhibitors representing 40 brands, Italy’s presence at MRKET was very much appreciated. The Italian firms were brought together by the Italian Trade Commission’s initiative “Made in Italy,” which groups all the Italian exhibitors in a dedicated aisle of the trade show, specifically signaled to attract the fair’s visitors’ attention and draw it not just to specific products or brands but more generally to the appreciation of Italian products altogether. 3,000 menswear industry operators from the US, Canada and Central America visited the show, showcasing the Spring/Summer collections of the best menswear brands worldwide. The Italian Trade Commission’s studies of the US Department of Commerce’s statistics show that in the period January-May 2012 Italy ranked 12th among the menswear and accessories suppliers of the United States, with positive trends in all the individual markets of the industry. The individual markets analyses show that Italian knitwear is the most appreciated product by US importers. It generated a total cash flow of $47.7 million and grew +3.39%. Suits are a close second, with a total cash flow of $41.8 million and a growth of +4.56%. “These elements of the ‘Made in Italy’ brand make it still very appealing for the American buyers,” even during times of recession, Musella adds. MRKET is a very exclusive show and it represents a very important showcase for the Italian brands, many of which will also participate in the West Coast edition of the fair that will take place in Las Vegas from August 21 to August 23. The New York show featured a curated section by fashion guru Michael Macko, called “Vanguards,” presenting 13 new and emerging brands and their collections. MRKET is also a very important networking platform for the fashion community, and it also featured a bloggers’ reserved area for the opinion leaders of 2.0 trends to report on what was interesting at the show in real time. Whereas Giovanni Taccaliti participated in the last three editions of MRKET, Camplin debuted at the trade show during this past edition. Camplin used to be a British brand of peacoats and naval tailoring that supplied uniforms to the Royal Navy during the Colonial age. Founded in 1850, it was bought in 2007 by Italian entrepreneur Matteo Bressan, based in Verona, who since then has been producing the Royal Navy coats with 100% Italian wool from Tuscany. “There’s great interest in our product, in both the sportswear sector and in the formal menswear sector. It has a long history and tradition while it is produced with new materials and has a contemporary fit that the younger customers appreciate,” Bressan tells i-Italy.